BUCYRUS — A vision, sold and peddled for years by Don Scheerer and Chuck Christman, became a reality this week. The Crawford County Veterans Hall of Fame Memorial is now open to the public in front of the county courthouse. It took several years, a lot of man-power and a boatload of volunteers to make the memorial a reality. “I think finally my blood pressure is going to go down,” joked Sheerer, who along with Christman, have led the fundraising efforts for the past three years. There are still more pavers to be placed and landscaping to be done, and there was an incident with one piece of the memorial Wednesday — and it will have to be repaired — but if anyone wants to see the eye-catching, dramatic memorial that was announced in 2014, it is ready. Sean Longstreth, of Longstreth Memorials, designed and supervised the building of the memorial on the southeast corner of the courthouse. Longstreth Memorials has been a part of many veterans monuments in recent years, including the one in Galion’s Heise Park and one in Mount Gilead. The new memorial includes a center monument and five columns around the center arranged in the shape of a pentagon. Those five columns represent the different branches of the military. Each also will be engraved with the names of the inductees in thedifferent classes of the veterans hall of fame. “We’ve got 10 classes so far,” said Christman, president of the Crawford County Veterans Hall of Fame. 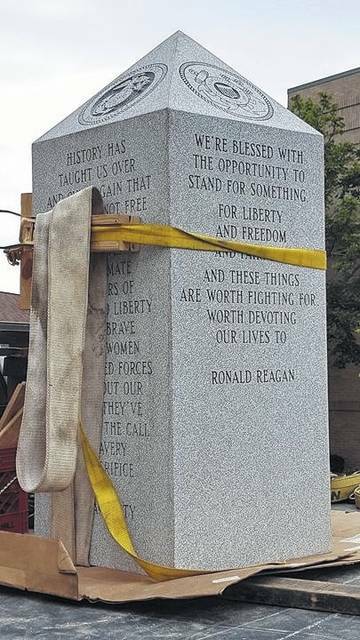 The center monument and outlying columns rest on concrete pads, that according to Roger Caris of B C & G Weithman Construction in Bucyrus, are 42 inches deep. A sidewalk leads up to the main monument and visitors can walk the sidewalk and view the names inscribed on each of the columns and on the individualied pavers. An old cannon, partially hidden in recent years by a bunch of bushes, sets off the memorial. Oberlanders is responsible for the landscaping, which Sheerer hopes will be finished within a couple of weeks. It took about three hours for the columns and centerpiece to be installed Tuesday morning. More pavers are ready to be added. A formal dedication is planned this summer, possibly in August. 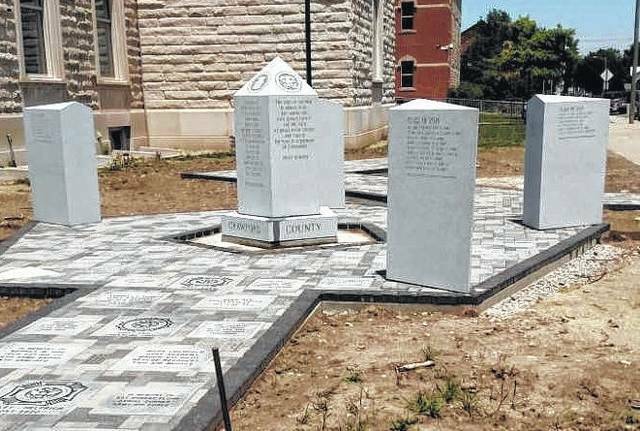 Christman hopes the memorial leads to even more people wishing to buy pavers. That part of the plan was already paying off Wednesday morning. Larry Shumaker, of Cuyahoga Falls, stopped by as the memorial was being put in place. His mother, Marilyn Shumaker lives in Bucyrus and her late husband, Edwin Shumaker, was a Korean War veteran. Larry Shumaker’s first thought as he walked by the memorial was to ask if it was too late to still purchase a memorial paver in honor of his father. He had a quick conversation with Sheerer and Christman, who told him that there is always going to be an opportunity for families — or anyone else — to purchase memorial pavers. Pavers may be ordered by calling Christman at 419-562-4740 or Scheerer at 419-562-9789. 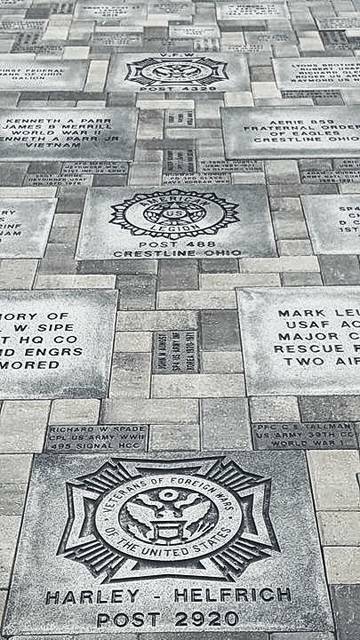 Information on the pavers and the nomination process for the hall of fame is available on the Crawford County Veterans Hall of Fame website: www.ccvhof.org. The Crawford County Veterans Hall of Fame Memorial was set into place Wednesday in front of the county courthouse in Bucyrus. A former dedication will be held in a few months. Workers from Longstreth Memorial place the main monument on its base n front of the Crawford County Courthouse. 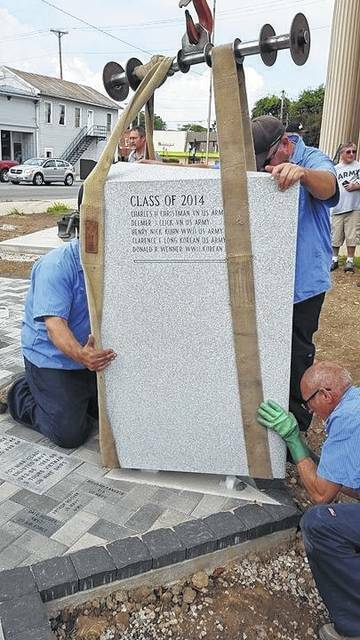 The Crawford County Veterans Hall of Fame Memorial was set into place Wednesday. This walk, adorned with pavers purchased and individualized my area business, people and clubs, lead up to the the Crawford County Veterans Hall of Fame Memorial. The sidewalk will continue along Walnut Street as more pavers are added. The main part of the Crawford County Veterans Hall of Fame Memorial sits atop a truck Wednesday morning in Bucyrus, waiting to be lifted, set and glued into place in front of the county courthouse. 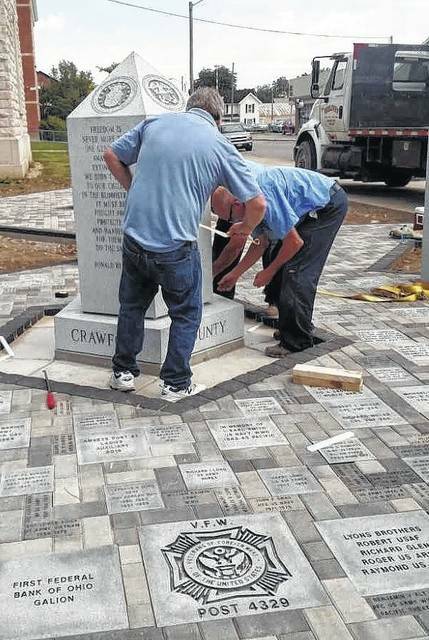 One of five columns, representing different branches of the military and inscribed with the names of inductees of the Crawford County Hall of Fame is set into place Wednesday morning in Bucyrus.